This blog post covers the Underpinnings Museum Twitter conference presentation from Alanna McKnight entitled Women and Corsets in Toronto, 1870-1914. 2 #UPMTC The data collected for this study was obtained from Toronto City Directories, newspaper articles and advertisements, and the Census of Canada – all between 1871 and 1914. 3 #UPMTC During the time period covered, Toronto had 51 businesses making corsets ranging from large national companies, to agents for companies outside Toronto, to individuals. 16 of these businesses producers were owned and operated by women. 4 #UPMTC Several of the businesses that were listed in the sources as being owned by men were actually run by women. Because of gender bias reasons, these women chose to have their husband or a male partner act as the public face of the business. 5 #UPMTC Many of the female-run businesses were small; however, one owned by Hannah Vermilyea employed upwards of 150 women. Vermilyea spent most her life living outside of Toronto, and owned corset factories in other cities. 7 #UPMTC Btwn 1871 and 1914 approx 754 ppl worked in corset making in Toronto: 496 women/ 258 men. Women were largely employed as factory labour (470), although the 26 employed as managers & clerks is significant, as these positions were not traditionally accepted “women’s work”. 8 #UPMTC Once manufactured, corsets in Toronto were sold at department stores & boutique shops or displayed at the National Exhibition, now the CNE. Toronto vendors also imported corsets from England, Belgium, and America, among others. Corsets cost between 24¢ and $20. 9 #UPMTC Manufacturers & retailers used ads heavily and not merely as enticement for sales. Ads were used to sully their competitors with patent wars, seek employees, sell businesses wholesale, and (perhaps most importantly) describe the transformative promises of their corsets. 10 #UPMTC The story of corset wear is complicated by the dress reform movement. Toronto women were advised to stop wearing corsets for health and aesthetic reasons by fashion columns, lectures hosted by pundits of the movement, and flyers and other polemic literature. 11 #UPMTC Yet alongside the vocal dress reform movement, women were also offered advice on the most current corset style, including how to wear corsets for cycling and other sports and even corset suggestions for women entering white collar work. 12 #UPMTC Although corsets are recalled in pop culture as anti-feminist and encumbering, the manufacture of these garments provided significant paid employment to women. Furthermore, the variety of styles available allowed women to choose how severely or not they wanted to lace. 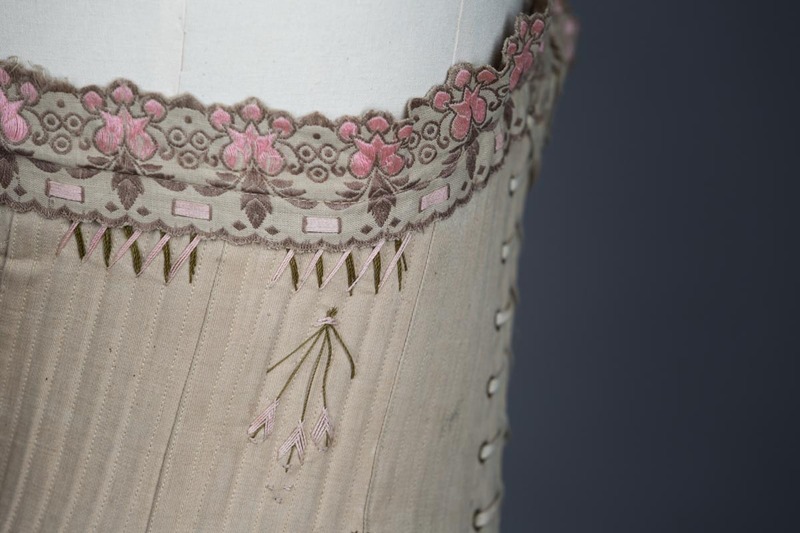 The header image for this post is of a ‘Droit Devant Forme Nouvelle’ drab coutil corset with flossing embroidery (c, 1900-5, France) from the Underpinnings Museum collections. Photography by Tigz Rice.